Written at 07:59:58 on Saturday, 9th December, 2017. This article is a combined speech/tutorial on electrical safety. I feel compelled to write this because after a number of years of both being in the electrical trade and also having vintage radio as one of my hobbies, I have found that if you aren’t concentrating 100% on what you are doing, the chance of electric shock is almost a certainty. Many newcomers to vintage radio make their biggest mistake when they have acquired their first receiver. They take it home, as I did, they sit it on anything they can find, as I did, they plug the radio in and turn it on, as I did. I didn't get a shock and the radio worked first go - call it luck because most of the time, as experience dictates, it hardly ever happens this way. Cracks in the cabinet which could lead to the cabinet falling off the chassis. Dried, cracked, frayed cords which expose wire and/or short out the plug. Mains plugtops being used as connectors for external speakers. Dried out or shorted filter condensers. Speaker cones and paper field coil insulation eaten away by mice. Tuning condensers urinated on by mice leading to corrosion and short circuit. The wrong valves in place which could lead to an overloaded transformer. An open circuit or short circuit in a power transformer. The above are just some of the things I can think of straight away and despite the trivial nature of some, all of the above problems can lead to either an unaware enthusiast getting a shock or in a drastic case, a house fire. You would be surprised at how some of these problems could lead to an insurance claim. Australia's electricity supply system is the safest in the world, largely due to very strict laws governing who can work on fixed wiring installations. Australia, along with New Zealand, Great Britain and a few other places have standards in place that dictate the nominal supply voltage that electricity utilities can deliver to consumers however these standards are not always reflected in practice. All Australian state grids, except Western Australia which is slightly higher, still deliver a nominal electromotive force of 240 volts to your building. This can vary 5% either way due to different loads on the networks at different times. It is therefore not uncommon to see the voltage rise to around 254 volts at certain times of the day. A short circuit is exactly what the term implies, where a current flow is taking a more immediate path because of the failure of insulation. At times this results in a shower of sparks and a blown fuse/circuit breaker and perhaps shattered pride. You might find that replacing the power point may also be required. An open circuit, especially on a high-tension device, can lead to other problems. The big danger here is that the fuse will NOT blow, which allows the problem to persist. An open-circuit power transformer can result in arcing and 'fizzing' which allows heat to build up and is potentially a recipe for a fire, especially in a wooden radio. To make sure that neither condition exists you MUST test a power transformer for continuity by doing a resistance check with a quality multimeter. Don't buy a cheap $20 outfit, it will not serve you well or last a long time. Buy a reputable brand. Fluke is the best meter available. Other good brands are Hewlett Packard or Tektronics and I think Clipsal make one too. You will also need a 'Megger' which is a trademark for an insulation tester. Meggers pump 500 volts at a very low current flow into the device you want to analyse so NEVER test anything electronic with it, you'll render it useless if you do. Once again, don't buy junk. If you have one of the old wind-up ones then this is fine though they are a little hard to use in confined spaces unless you have crocodile clips on the leads. 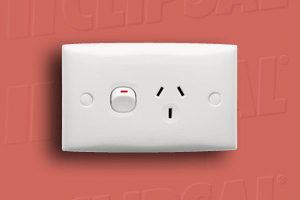 Clipsal make a good electronic one and they can be bought at electrical wholesalers. They are not cheap but nothing that is made to last will be. When testing the insulation on a transformer place one clip on the laminations and the other is used to test EVERY wire coming out of the windings, one at a time of course. NOTE: Some people like to skylark with meggers and zap their friends. This is usually in fun and while some people resist the tiny current flow fairly well, most do not and the shock can be quite painful to some so please do not do it. This game could also affect those with pacemakers. Cloth covered cords were used on all old radios and indeed all old appliances. Because cotton is not a durable material these cords must be treated as 'stuffed' each time you acquire a set and the cord should always be replaced, no matter what. The individual wires inside the cord are covered in Vulcanised Indian Rubber (VIR) and while the cotton may still look okay, the rubber can split, harden and crack or just decompose into a gooey mess, all of which may not be apparent on the outside. Do the right thing and replace the cord. 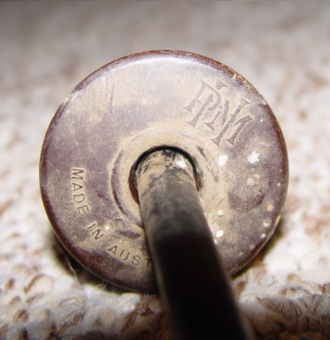 Australia has several vintage radio associations that hold swap meets and have websites that link to members who sell many items at reasonable prices and even if you arn't a member you can go to BBC hardware and buy a new appliance cord which is cotton covered and it has a plastic moulded plug fitted. Either is fine. If you are in a remote area and these resources are hard to find then you still owe it to yourself to replace the cord, even if it is with a modern grey plastic coated one. An ugly cord is better than dying. Some people, out of the sheer fear of electricity will simply replace all Bakelite plugtops with modern plastic ones. This is not such a bad idea though I will reuse a Bakelite one if it is in as-new condition. 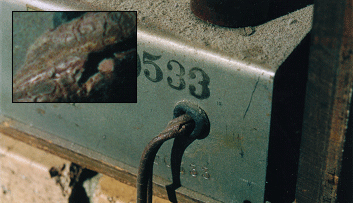 This means no scratches, chips, cracks or green tarnish or slime on the brass connections. Always remember though, if a Bakelite plugtop is stepped on or dropped it is more or less damaged and should be replaced regardless. Bakelite can have a hairline fracture and still look okay and you don't want the plugtop to fall apart while you are trying to remove it from the power point. It only takes one stray fingertip to deliver the 50mA required to kill a healthy adult male in one second - that is all it takes to fibrillate the ventricles in your heart. As a comparison it takes 250mA to run an average light globe. When there is a potential electrical fault there's never a warning as to what will happen next. You only have one chance. Australia has far more cemeteries than it does hospitals. If the plug is cracked or chipped, it is best to replace it. Many people have a small, cramped and messy area where they work on radios and other things. As I live in a flat I use a spare bedroom for this purpose. It's small and cramped but it's all I can really do. I make the best of it though and store things right out of the road of the immediate workspace and the path to the door of the room. As can be seen in the picture above, I use a wooden benchtop and while unseen, there is carpet on the floor providing some protection against electric shock. I play my part too. When working on a radio I always wear work boots and keep everything clear of the chassis, including test equipment. Nothing would be worse than having a chassis fall into your lap with a 700 volt high-tension circuit ready to give you the mother of all rude awakenings. Even if it doesn’t kill you, it's going to hurt a hell of a lot and probably burn you too. Do not play with things while the chassis is live. In some older sets and especially the very rare ones, it is possible to get bare chassis terminals which provide a lethal dose of electricity instead of a great place to terminate the aerial wire. I have also been told that some rare valve types operate the tips at high-tension, rather than just being a grid leak. Like everything in life, there is no standard here. Speaking of standards, none existed for electrical appliances back then. All but the most expensive receivers had no back cover and there was often bare terminals installed for various reasons, in one set I saw once there were terminals for the mains transformer. One set for the 5V valve filaments, one set for the 6V dial lamps, one set for the 240V mains connections and another for the 2x 350V high-tension supply. It's just not the place for wandering fingers.